Enjoy the feeling of being pampered with your favourite towel after bathing? While you may have bought your favourite towel that is super soft, superb absorbent and luxuriously thick, here are 6 quick tips for your towel care. With these 6 quick tips and a little care, you can extend the longevity and fluffiness of your towel. Before using your towel for the first time, wash it in warm water with a little less laundry detergent than suggested to remove extra dyes or fabric softener as well as reducing shedding (shedding can often be found in new towels). • For coloured towels: Add a ½ cup of white vinegar during the wash. This helps to set the dyes and keep the colours longer. • For white towels: Wash it more frequently with about ¼ cup of peroxide per load. Fabric softeners contains silicon that will make the towels water repellent. In addition, using fabric softener too often will reduce the absorbency of the towels. If you wish to soften the towels, the best method is to use white vinegar during wash. Pour ½ cup of white vinegar instead of soap or laundry detergent during the regular washing cycle. The reason many towels are hard after washing is because they have soap left in them. Remember how smelly the towel is after you left it in the gym bag? Add a ½ cup of baking soda with laundry detergent during the wash to get rid of the bad musty smells. Moist towels are a perfect breeding ground for bacteria and this can lead to bad odours. To prevent getting smelly and musty towels, hang up your towel in a well-ventilated area, so that it gets dry faster. Washing too many towels at once will disallow the washing machine to wash your towels thoroughly. In addition, the dryer will not be able to allow enough air circulation to fluff up the fibers of your towel. As a result, your towels will come out stiff and hard. If you wish to keep your towels as fluffy as it was originally, tumble dry it. Tumble drying is a process to dry the towels by spinning with hot air inside a dryer. However, bear in mind that the best temperature to tumble dry is under 60°C as high heat may damage the towels. Our Luxurious Towels are made from 100% Terry Cotton and manufactured in Malaysia. All our towels are luxuriously thick, super soft and superb absorbent with an extra personalised embroidery service. How do you feel when you receive a gift that is personalised? Wow, what a thoughtful gift! I am feeling so special. This person must have put in lots of thoughts to make me feel special. This is THE gift. The only ONE. Gift giving is not about the size of the gift nor the price tag. The art behind gift gifting is about making that special someone happy. We want to let that special someone know how we feel about them. Selecting a gift for special occasions is challenging but can be quite fun and creative. At Luxurious, we believe personalised gift creates happiness for both the sender and receiver. Haven’t you heard of “Happy Wife, Happy Life”? Haha, just kidding. And yes, we love towels – it is one of the best gifts that everyone needs. We have carefully selected our Luxurious Towel. Yes, it is five stars graded – used by many 5-starred hotels. Not kidding, the hotel guests love our towels. These are the three main reasons why they love our towel. Aside from carefully selecting the Luxurious Towel, we’ve taken the extra miles to make it even more special. SO, what are you waiting for? Get a personalised Luxurious Towel and be pampered now! Hey, you are still here! 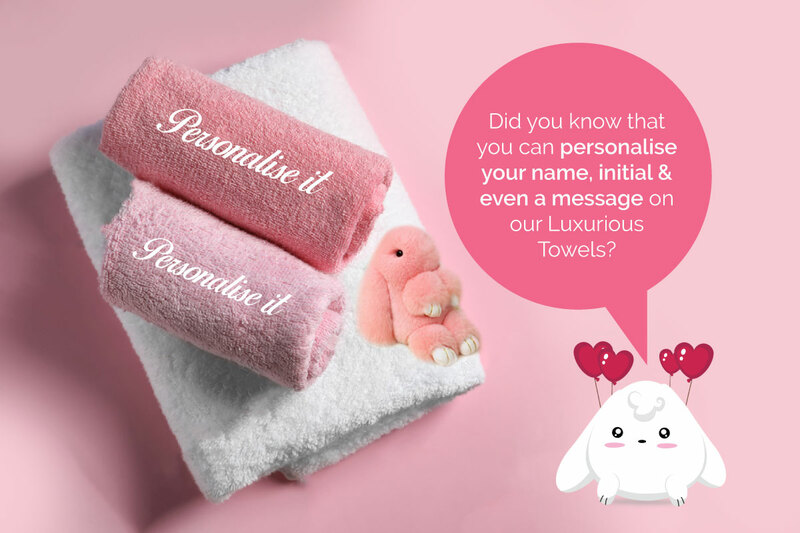 Perhaps not for you, get the personalised Luxurious Towel to impress your special someone now. Delivery is made through our logistics partner GD Express/PosLaju. If you wish to order more than 10 pieces, please contact us at +6010.222.7286.